Recently we assisted one of our clients who had the unenviable issue of excessive out of hours failures that were resulting in high costs for after hours tradesman. Their site is a complex site containing an acute medical facility and several community health centres. Yimelo suggested the adoption of a checkIT process for their weekly plant and building checks, that could deliver both a process that ensured all systems were operating as intended and deliver a targeted issue list that could be worked around or dealt with at the much cheaper “in business hours” rate. 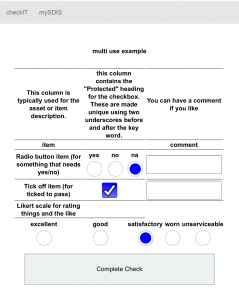 Working with the engineer, maintenance manager, fitter and carpenter a checklist of critical systems was developed and entered into the checkIT system along with the appropriate recipient list for reporting. The process was agreed: Every week, a different member of the team would perform the comprehensive site check prior to their turn being the after hours duty officer. This would ensure that the person on call had a good handle on the state of the facility, and would have the opportunity to collate “All the little issues” into a single repair ticket that could be actioned before problems arose. The success was immediate and dramatic. The adoption of the checkIT system took their recall rates from an average of 14 per month and delivered a result of four calls, of which none required physical attendance in the month following implementation. With an average trade labour rate of $50AUD per hour for call back work across our industry and three hours double time the call back minimum rate (not to mention lost productivity from overnight attendance) the checkIT system saves approximately $48,000 every year for our client. This has been a welcome relief to their budget, and their staff who can now spend family time more confidently when they find themselves on-call. To discuss how we can assist your business or department, or to request contact with the referee to whom this story refers, contact us via our contact page.